My favourite West Ham game of all time, West Ham 3 Eintracht Frankfurt 1, April 14 1976, was the second leg of the European Cup Winners Cup semi-final where we overcame the 2-1 deficit from the first leg with goals from Keith Robson and two from Sir Trevor Brooking. The Robson goal was a 30 yard screamer following an excellent long pass from Brooking. Most people thought that the chance had gone when at first he appeared to lose control of the ball. But he regained his balance and the South Bank net bulged from a wonderful left-footed strike. Brooking’s goals were a header (yes, he did score goals with his head, especially important ones, contrary to popular myth), and another which showed off his wonderful control and balance in such atrocious conditions. There was an electric atmosphere in front of around 40,000 rain-sodden fans inside Upton Park. On that night over forty years ago it had rained all day and continued to pour down throughout the game. The pitch was a quagmire and barely a blade of grass was visible in the mud. 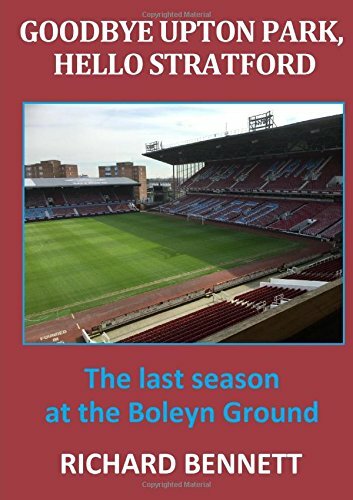 As I stood on the North Bank terrace (now the Sir Trevor Brooking stand) with friends, the only stand visible that remained in 2016, when the final game was played at the ground, was to our left, the East Stand which had been in use for about eight years. The old West Stand was to our right and the South Bank faced us at the other end of the ground. At least when we were inside we were dry as a roof covered most of us. Although we had won the FA Cup the previous season we had finished in the bottom half of the table, and at the time of our meeting we sat in sixteenth place in Division One having been at the top of the table in November. Our decline in the league that season was as steep as it gets and we had won only one league game in the whole of 1976 (1-0 at home to QPR in January). From Christmas Day that season we played 21 league games, winning one, drawing six, and losing 14, and eventually finished 18th. It was therefore even more remarkable, given our form and the conditions, that the game was such a magnificent spectacle. The Germans played their part and came close to scoring a second away goal which would have seen them in the final. But we held on, and overturned the deficit from the first away leg to win the tie 4-3 on aggregate, and progress to the final, where we lost 4-2 to Anderlecht in the infamous Heysel Stadium in Brussels. The number one song in the charts at the time was Save Your Kisses For Me, by the Brotherhood of Man. The Eurovision Song Contest has been running for roughly the same amount of time that I have been following West Ham. The first UK entry was in 1957, the year before my first visit to Upton Park. For younger readers, and anyone who knows anything about the Eurovision Song Contest, the United Kingdom was once a leading player in this event. However in recent years, partly for political reasons, the changes in the make-up of Europe, and the fact that we don’t seem to bother about the contest to the same extent as other European nations, we have not been remotely a contender in the event. This chart-topper won the 1976 contest, one of five UK winners ever. Can you name the others? Up until 1998, the UK had only finished outside the top ten on two occasions, and as well as the five wins (the last was in 1997), we were runners-up on 15 occasions. Other notable songs in the charts at the time of this famous game were: I Love To Love, by Tina Charles, which had previously been at number 1; Pinball Wizard, by Elton John, his rendition of the classic Who song; Yesterday, by the Beatles; and Fernando (sounds like a footballer!) by Abba.